Did you know June is Ohio’s official wine month? What better way to celebrate than to take a trip to some of the best wineries in the state! There are 268 wineries throughout Ohio so there’s plenty of options to choose from, whether you’re looking for a date night or a weekend with friends! While there are so many wineries to choose from, I’m going to share with you a few of my favorite spots from the Geneva area. This beautiful, quaint winery is one of my favorites. The interior is just as lovely as the exterior. We sat outside during our visit and bought a bottle of their red blend, which was delicious. We had the summer salad, as well as the margherita pizza. Yum! Why is this place so high on my list? Amazing wine, great food and it’s so scenic! Our next step was M Cellars. I loved the variety of red wine options they had to pick from. While I’m not opposed to white wine, I typically prefer semi-sweet reds. After tasting the Dry Rose, Pinor Noir, Syrah and Noiret, we purchased a bottle of Noiret and sat outside to enjoy a glass with a view. I was surprised by how much I loved the Noiret. You could really taste the oak and cherry. If you don’t finish your bottle, they will cork it for you to take home! This winery is unique and most people know it as the “church” winery because it is housed in a century old church that originally sat in Shalersville, Ohio. The interior still has a lot of the church characteristics. You can sit in one of the pews and marvel at the stain-glass windows inside, or you can go outside where they have two large patios and gaze out at the vineyards. In terms of wine, I sampled the Exodus, Trinity, Pinot Noir and Temptation. My favorite wine here was Trinity. Although the wine was all amazing, the view from the patio alone made it well worth the trip. You can see vineyards for miles! This was our last stop for the day. It was packed as there was a live band, as well as a wedding. The atmosphere was so lively and there was plenty of wine and food options. We ordered a veggie pizza and the red sangria. The sangria was full of fruit and was incredibly refreshing on a hot summer night. If you’re looking for a drink to cool you down, sangria is the winner. While there are plenty of amazing Ohio wineries to choose from, these are just a few of my favorite places. What other Ohio wineries do you love? A special thanks to the Ohio Grape Industries Committee and Hello, LLC for sponsoring this post. 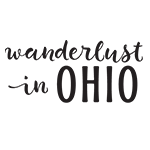 WanderlustinOhio is not affiliated with the #30CheersOH daily contest. All opinions are my own. Totally agree with all of the above! South River is hands down the best in my opinion! Delicious wine and amazing views! Great article Mady!